Never underestimate the value of your hands. Your hands help you every second of every day. They are there to help you cook your favourite meal, play catch with your kids, and hold your loved ones close. Your hands are a complex instrument that can achieve endless tasks. The hand has 27 bones, including eight wrist bones, which means there are 27 bones working with countless muscles and tendons in an intricate system to provide success to industries across the board. Protecting your hands while at work and on the job should be a top priority, every day. According to the Bureau of Labor Statistics in the USA, injuries to the hand, wrist and finger account for 23% of total workplace injuries. The Bureau ‘guesstimates’ there are about 110,000 lost-time hand injuries annually. Some of the most common hand injuries included lacerations or cuts, amputations, loss of finger(s), burns by chemical or fire, broken pieces of material becoming lodged in the hand, and crush injuries resulting in broken bones. The United States Occupational Safety and Health Administration (OSHA) requires that all employers provide, at no cost to the employee, appropriate hand protection relative to the task to be performed, conditions present, duration of use, and the hazards and potential hazards identified. The important part about hand safety is choosing the appropriate glove(s) for the job. Today there are numerous types of gloves that have been created to prevent incidents and injuries to the hands of your workforce. Of course assessing your job task and hazards is the first step. 1. Identify why a glove is necessary a. Are you protecting the hands against the product? b. Are you protecting the product against the hands? 2. Identify the hazard a. Abrasions, cuts, chemicals, viruses, temperature, power? 3. Select the appropriate material for that hazard a. Latex, nitrile, neoprene, Kevlar, leather or something else? 4. Size the glove correctly a. Small, medium, large, extra-large? 5. Assess other factors a. How long should the gloves be? b. Do you need a safety cuff? c. Is there vibration? This is just a short list of common questions that should be answered to assist in choosing the right gloves. Knowing which type of glove works for the job task will greatly increase worker safety and productivity. It is essential to understand that failing to protect the hands can result in an expensive injury. According to the OSHA Fact Sheet 93-03, the financial cost of these injuries is more than $300 million per year in lost production time, medical expenses, and workers’ compensation. This results in an average of about $26,000 per injury. Ultimately, it will be up to the employer to evaluate their hazards correctly to help prevent any injuries from happening. Thankfully, we live in a world today that has given us countless options to protect our hands from various hazards. There is a glove that is made to fit almost every hazard; the hard part is choosing the right one. Reusable gloves are generally 18-28mm in thickness, and they interfere more with dexterity and sense of touch compared to disposable gloves. Reusable gloves offer great protection against chemical permeation. Permeation is the process by which a chemical can pass through a protective film without going through pinholes, pores or other visible openings. Chemical permeation can be described in simple terms by comparing it to what happens to the air in a balloon after several hours. Although there are no holes or defects, and the balloon is tightly sealed, the air gradually passes through (permeates) its walls and escapes. This is the type of process you want to avoid when choosing gloves to handle toxic chemicals. You should also read the Degradation Rate on a glove before purchase. Degradation is a reduction in one or more physical properties of glove materials due to contact with a chemical. Some chemicals may cause certain glove materials to become hard, stiff, or brittle, as well as softer and weaker. You want the glove to hold up long enough to perform the task without harming the worker. In order to prolong a glove life cycle, they need to be properly maintained. Most reusable gloves have a longer cuff length than disposable gloves from the same material, to offer better protection against liquid slipping in from the top of the glove. Disposable gloves work very well in medical or healthcare facilities. They provide protection against bloodborne pathogens and other infectious diseases. These gloves can be made from latex, latex-free and Nitrile, which allow the user to retain their sense of touch and agility, and are designed for a one-off usage only. Because of the tight fit and allowed agility, disposable gloves are great for persons working in the healthcare department who perform intricate procedures with their hands. They also work well for persons working with low-toxic chemicals. While working with electrical equipment, it is very important to make sure that gloves are insulated properly to protect against electric shock. Electrical rubber insulating gloves provide significant protection for anyone working with and around electrical equipment, such as power lines, switchboards, or appliances, as well as any source that could have a possible electrical current. Along with shock protection, rubber insulated gloves provide protection against ventricular fibrillation, burns, like arc flash, and neurological effects. It is very important that leather protectors are worn over electrical rubber insulating gloves to provide protection against cuts and nicks caused by contact with electrical components. These gloves should be inspected every day by checking for cuts, nicks, or any other damage. To help, blow air into the glove to check for any type of air leak. In addition to daily testing, every six months rubber insulated gloves are required to be dielectrically tested to make sure they hold up against any electrical charge. A worker who is handling sharp materials, such as working on a product assembly line, will need gloves that are cut or puncture resistant. Mechanical aggressors, such as knives, metal parts, and sharp objects are responsible for nearly 30% of lost time work injuries and contribute to 80% of the injuries involving the hands. Abrasive cuts: These are extremely common in many different industries. 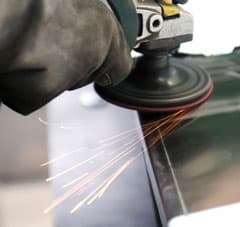 For example, an abrasive cut occurs when a worker is constantly rubbing his/her glove against the parts of a machine that could be sharp or rugged. Slicing cuts: Workers who are at risk for this type of cut typically reside in the food industry, or any other workplace that involves the use of knives and sharp blades both manually and mechanically. Impact cuts: These are the least common of the three types of cuts. These occur when a piece of sheet metal or glass suddenly comes in contact with the hands or fingers with heavy force. Gloves that are made from Kevlar® or Dyneema® provide great protection against higher level sharp objects, unlike leather and cotton which provide a lower level of protection. Understand that there is no glove that offers complete protection against a circulating or serrated blade; engineering controls must be relied upon for protection from such a motorised blade. Cow: The most common and popular type of leather used for gloves is cow skin. It is moderately priced, comfortable, and durable and has very good abrasion resistance. It is also warmer than pig or goatskin leather and is more heat resistant. Pig: This leather offers the greatest breathability due to the porous texture of the hide. It becomes softer with use, withstands moisture without becoming stiff, and can also be laundered without losing its shape or function. Deer: Sometimes referred to as ‘buckskin’, this leather is soft and comfortable, with more flexibility and a longer wearing period than cowhide. It is also the warmest out of all the leathers. Goat: This leather is the strongest and most durable for gloves. The natural lanolin in the skin makes the glove very supple, waterproof, and abrasion resistant. It is great for tasks involving fine dexterity. Another way to choose your leather gloves is by cuff. The cuff can prove to be very important because of the different compatibilities it provides. For example, knit cuff gloves are designed to protect the wrist and help prevent particles from falling into the glove. Most slip on gloves do not have a cuff and end at the wrist; they are the easiest to take on and off and are the most economical. Leather gloves with a safety cuff are designed with a slit at the side to enable the wearer to throw the glove off easily if they get caught. The gauntlet cuff has the same features of the safety cuff, but the cuff itself is longer by around four inches, allowing sleeves to be tucked in. Finally, gloves with the shirred wrist cuff have elastic to help gather the leather at the wrist, providing a more comfortable fit. For workers working with hot surfaces, such as welding, fire, steam, or any other tasks that involve high heat, heat resistant gloves are a must. There are different styles for different levels of thermal protection. An important factor to keep in mind when choosing heat resistant gloves is that the glove should allow for a good grip on the hot surfaces for better dexterity while working. Some different materials that work well with high heat are Kevlar®, Flextra®, terry cloth, wool, ceramic, cowhide, and cotton. When choosing heat resistant gloves, always remember to fit the glove to the task and then to the worker. Workers who are involved with tasks that include a lot of vibration, such as from a vibrating tool, equipment, or piece of machinery need anti-vibration gloves to create a buffer that absorbs vibrations transmitted to a worker’s hand/arm. Exposure to hand-arm vibration can lead to short and long term discomfort and injury to hands and wrists. The material used in these gloves is called viscoelastic, which puts air pockets in the palm and fingers of the gloves to absorb the excess vibration. According to the Center for Construction Research and Training (CPWR), anti-vibration gloves reduce the frequency and intensity of the vibration transmitted from the source. Although they are a solution to helping withstand vibration, they should not be used for an increased duration of exposure. CPWR studies show that safety and health experts believe there is an increase in productivity from the use of anti-vibration gloves, as well as a reduction in risk. Workers who perform job tasks outside in harsh, cold weather should be equipped with winter working gloves. A good pair of winter work gloves can help to prevent frostbite and allow maximum hand dexterity to grasp and hold on to objects. These gloves should have a lining designed to wick moisture away from the skin and keep the entire hand as warm and comfortable as possible. Winter gloves come in many types, such as waterproof or chemical resistant, and the type of glove needed depends on the nature of the task. Below are a few suggestions for winter gloves. Gortex®: This material is known to be waterproof and very insulated. These gloves are lined along the palm and thumb with specialised suede or leather to protect the hands. Three layer wool: These gloves are made of wool on the outside and have fleece lining on the inside. They are designed to prevent heat from escaping the hands by having a long cuff to keep the cold out of the sleeves. Thinsulate: These gloves are a good choice for workers involved with working outside in the snow and rain. Insulated Nitrile® gloves: These gloves create a tough barrier against cold and hazardous chemicals and are dipped twice in nitrile butyl rubber to form a rough finish to create a good grip. Insulated freezer gloves: These tough, cold temperature work gloves are constructed of heavy leather around a thermal lining. The glove affords flexibility and protection and is excellent for most icy conditions. Choosing the correct glove size for your workers is equally important when purchasing gloves. Knowing how to accurately measure and choose glove sizes can increase safety and productivity in the workplace. Gloves that fit correctly give the worker better dexterity to allow for better accuracy and efficiency in their jobs. According to another leading distributor of PPE, if gloves do not fit properly, it can often delay work or result in hand injuries. If the hand protection is too small, it may cause hand fatigue and decreased dexterity. If the protective material is stretched out, it is more likely to rip or tear during use, which is costly to replace, as well as dangerous to the wearer. Gloves that are too large or too loose also create larger safety issues, such as getting caught on jagged edges, or moving parts of machinery pulling the glove right off the hand, or potentially pulling the wearer’s hand into moving machinery. It is also important to note that the gloves should be comfortable. If the worker finds the gloves uncomfortable, they may be less likely to keep them on, thus leaving unprotected hands that are much more at risk for injury, which can lead to an increase in medical expenses and workers’ compensation. To fit the gloves to the hand, use a tape measure to measure around the knuckles of the dominant hand. The number in inches is the size glove you want. For example, if you measure your hand to be 8 inches, you would wear a size 8 glove. There should be sizes available for both men and women employees. Another factor to consider is the length of the glove, which measures from the forearm to the hand. This can help prevent against splashes and help those who submerge their hand in any type of material. Gloves that fit properly will help employees stay protected and avoid accidents in the workplace. Your workers are the hands of your business. They make machines run, processes develop, and help revenue climb. Keeping worker hands free of injury should be a top priority, as employees who know they are protected and have a safe working environment can be a major catalyst for improved work performance, job satisfaction and positive morale, to the benefit of the entire workplace. Employers should stay informed and educated on hand safety and keep up to date on the latest hand protection. The practise and implementation of a healthy hands’ programme will improve a company’s safety culture and their bottom line.